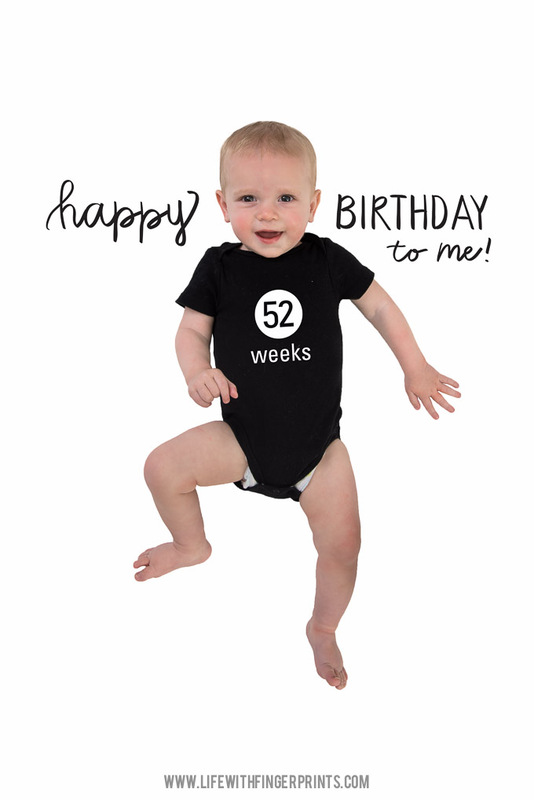 I took pictures of Briggs on his birthday – 52 weeks old. And he was grumpy. I tried to shoot some pictures and he was crying in all of them. I took a break for a couple hours, he took a nap, he ate some food and wouldn’t you know it round two was just as successful as the first. All crying pictures. I thought I might try another day, but a the week slipped by and I sat at my computer tonight clicking through all the photos. I found just one photo where he wasn’t crying or scowling. One. So I used it. I almost chose one of the hundred crying pictures just because that is just how he is right now. But it’s the final capstone picture to the project and years down the road I want to trick myself into believing he was a content happy baby. He wakes up most nights – multiple times, but we don’t get him out and he gets back to sleep on his own. He’s not walking yet and he’s still a ways off. All of our kids tend to walk later. He likes to dance – at least he bobs his head and shakes his bum. He loves to drop things off the highchair. Not usually food – just toys. It’s a game he plays with his siblings – they put something on his tray and he pushes it off. He loves to climb up the stairs – and although he can get down, instead he chooses to scream from the top of the stairs. He loves balls – he throws them in front of himself and chases after it. He says mama and Steve is working like crazy for dada. He has stranger anxiety and prefers to be in the arms of mom and dad. He doesn’t like to be alone which makes it difficult to work around the house. He is sustained by milk, table food and one breast feeding a day – which is coming to an end soon. He had his first haircut last week – not that he has a lot of hair but it was enough on the sides and back to warrant a trim. He is 1 years old. Bring on the toddler stage.